My friend Bob emailed a link to this NYTimes book review: Richard Feynman, the Thinker. It's a good review of what appears to be a good book, a noble addition to the overflowing shelves of books about the Nobel-prizewinning physicist. Among other things he was an incredible lecturer, fitting that he's shown at right in 22 Gates, "the low temperature lab", a lecture hall in the sub-sub-basement of the physics building at Caltech. Yeah, I did see a Feynman lecture while at CalTech. By the time I got there he was “retired”, but occasionally came out to give talks. I knew him slightly from before, he was a friend of my father’s, actually played bongo drums at my parents’ wedding :) My dad was a postdoc at CalTech in the late 1950s, working for Linus Pauling. Anyway when I was a freshman I remember one week the Physics I lecture was moved from the usual hall to a much larger one, and rumor spread that Feynman himself was giving a lecture. Sure enough, on the day there were about 2,000 people in attendance besides my little class of 100, to hear him speak about Special Relativity, many of them senior administrators and faculty. What can I say, he was great; to this day I remember it so well. He spoke with a distinct New York accent, used a lot of slang, and was completely irreverent, yet he discussed the subject as only one who completely understands it can do, with simple analogies that led easily to "aha" moments. He also kept referring to Albert [Einstein] and Murray [Gell-Mann], which was a little unsettling :) I remember walking out of the hall dazed and amazed, sure I *finally* understood Special Relativity. Of course two hours later I had lost it again, never to return. Anyway that was cool. 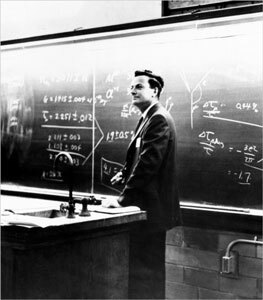 I’ve read a number of biographies of Feynman, he was of course an amazing character beside being a brilliant physicist. “Surely you must be joking, Mr. Feynman”, remains my favorite. I'll have to check this one out.